Tecplot 360 is a product from Tecplot, Inc. Tecplot 360 is visualization software with a complete suite of XY, 2D, 3D and animation capabilities for visualizing simulation data. For a detailed list of features, please check the Tecplot 360 web page. See LC visualization software page. On the LC machines, the module load tecplot command will setup your PATH and any other needed environment variables. On a local Linux workstation, be sure to follow the Installation Guide instructions as noted below for additional variable setup. As a convenience, you can just type tec360 to start the latest version of Tecplot from /usr/tce/bin. If this does not work, try typing module load tecplot before running tec360. Tecplot 360 manuals, FAQ's, Support Notes, tutorials, and other helpful information can be accessed from Tecplot's Support web page. Help is also available from Help menu within the Tecplot application. Additional help can be obtained through Tecplot's technical support services. You may use the LLNL Tecplot 360 license number in your support requests. The license number can be found by running Tecplot 360 on one of LC's machines and selecting the Help > Tecplot 360 EX Licensing menu item, or by contacting lc-graphics@llnl.gov. If you have an account on the LC platforms, you can install Tecplot 360 on your local LLNL workstation and use the LC license. Tecplot 360 can be downloaded from the Tecplot Downloads page after you register for a free user account with Tecplot. Alternatively, to avoid having to wait through Tecplot's account request process (which may take up to two business days), LC users can download the installer from the CZ Confluence page. If you do not see the installer you are looking for, please contact lc-graphics@llnl.gov. For detailed installation instructions for each individual platform, please refer to the Installation Guide (available from either the Tecplot Documentation page or LC's CZ Confluence page). The first time you launch Tecplot 360 EX after a fresh installation, you will be prompted to enter your license information. 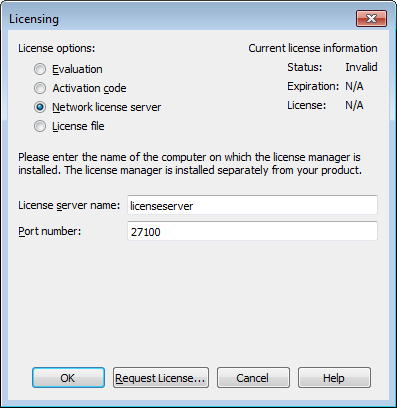 You will also see this dialog if Tecplot 360 EX cannot validate your license information (for example, because your evaluation license has expired, or because the network license server is not available). Additionally, you may change your license information at any time from the Help menu. In order to use LC's Tecplot license, you will need to setup the connection to the Network license server.